A movable stop member for windows and doors has body and member of fixing. The body has the lower part that is ended with base and the upper part installed with possibility of displacement in vertical plane, and fixing member is secured on the upper part of the body and is arranged as console with restricted at both ends with lugs flat horizontal surface for contact with the lower end of the window leaf or door leaf. Project aims at simplifying the construction of the stopper for doors and windows, reducing the consumption of materials. Created stopper enables implementation of reliable fixing of the window sash or the door in required position. Used for various types of windows and doors. Stopper will be useful in any home. The device is unique in its simplicity of construction, versatile, easy to install, easy to manufacture and easy to use, and inexpensive. 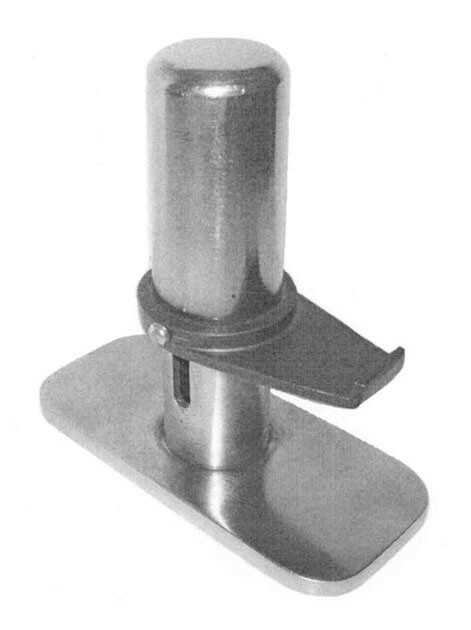 The stopper does not damage the construction of windows, doors, protects their surface sufficiently mobile, it does not require stationary installation. *Full assignment of rights. Contract of alienation. Page created at 2019-04-25 18:12:56, Patent Auction Time.